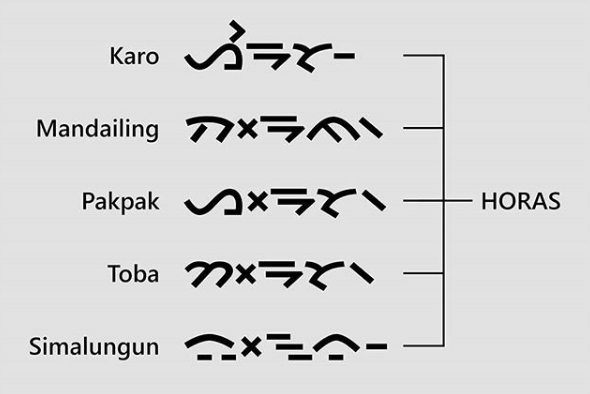 Aksara Batak, or Batak writing, is used to write the five related Batak languages of Northern Sumatra: Karo Batak, Toba Batak, Dairi Batak, Simalungun/Timur, Angkola, and Mandailing Batak. 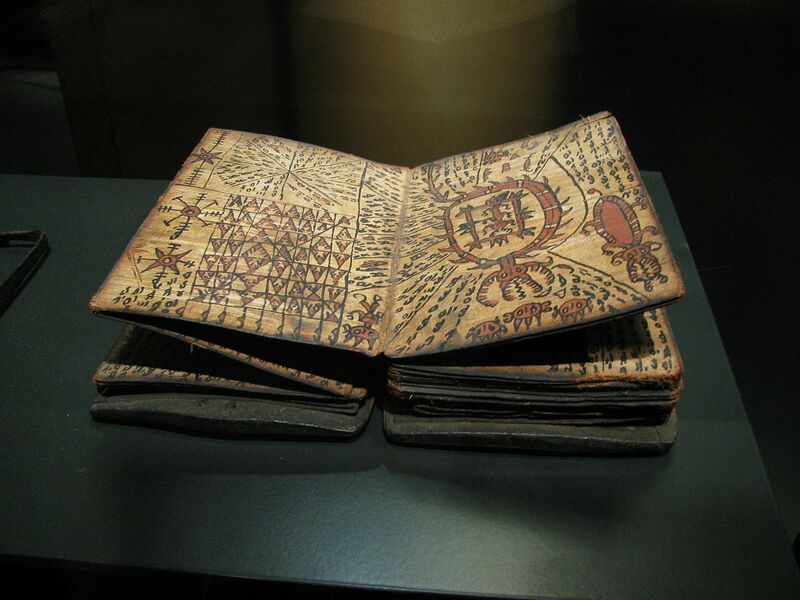 “[M]ost of the literature they produced belongs to the realm of magic, the hadatuon — the “science” of the datu, the Batak magicians and healers. 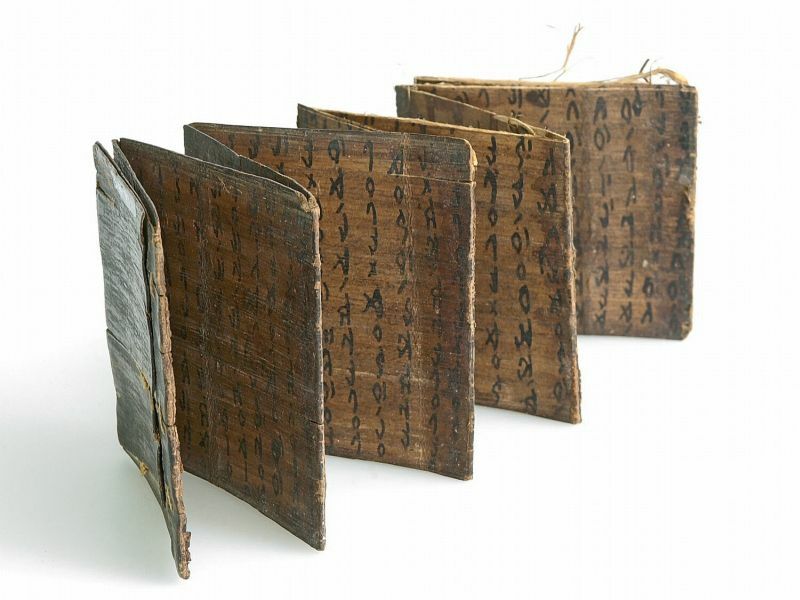 The datu, or guru — as they were also called — wrote down their knowledge on leporello shaped books made from the bast (the inner bark) of the alim tree (Aquilaria malaccensis and other Aquilaria species), but occasionally they also used bamboo or buffalo bones as writing mediums. 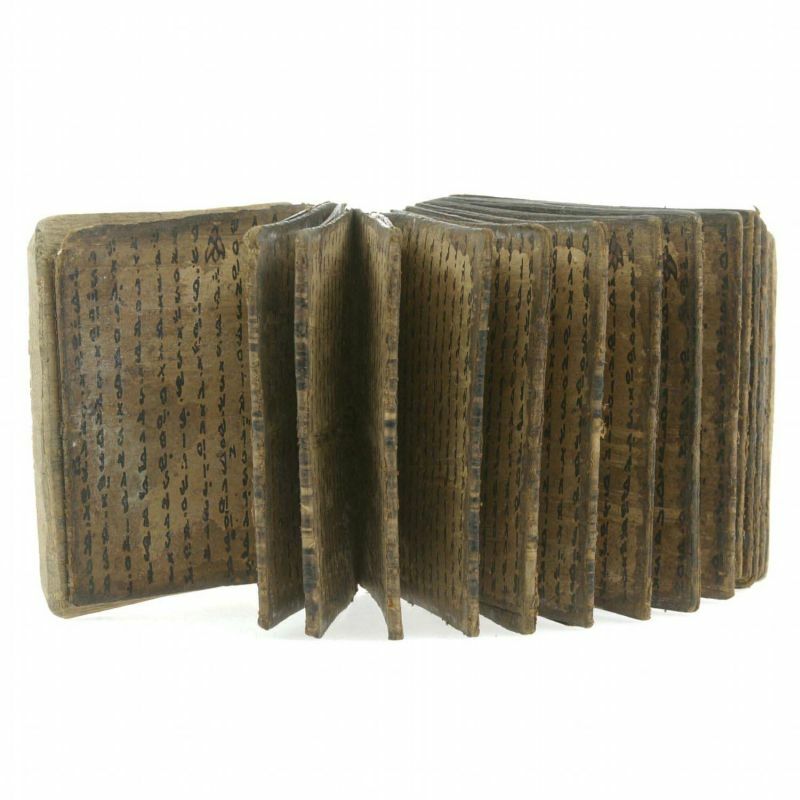 There are an estimated one thousand pustaha — as these bark books are called — in various collections, mainly in the Netherlands and in Germany, and a considerably larger number of bone and bamboo manuscripts. 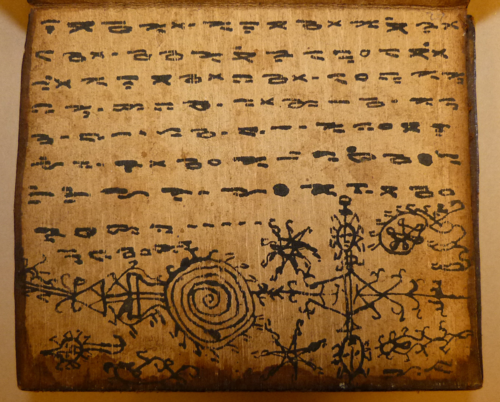 “The datu were the professional scribes of the Batak, but in the egalitarian society of the Batak every person, man and woman, could learn the art of writing, and many did, especially the young men, because it enabled them to be engaged in the art of writing love laments that were used in courtship rituals. 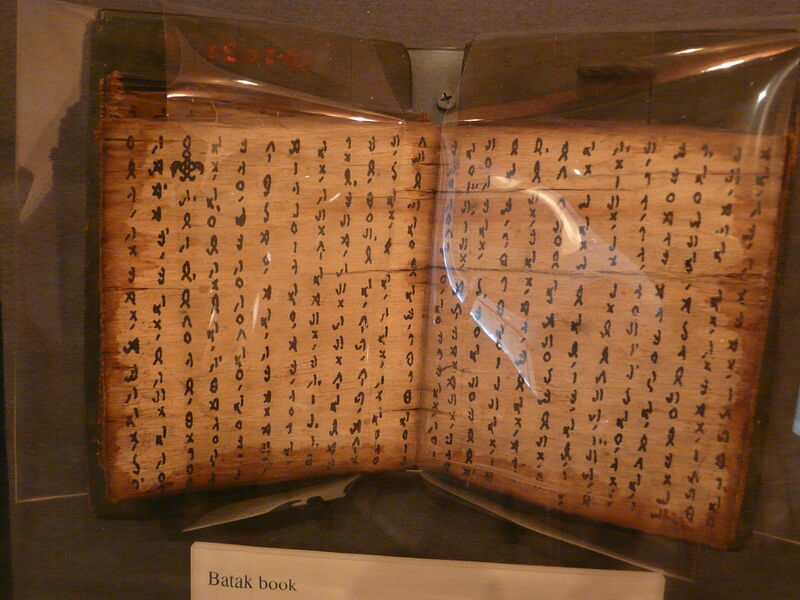 Knowing to write was also important for the traditional leaders, the raja, who occasionally would exchange letters written on bamboo nodes, and, last but not the least, for everyone engaged in an unsolved legal dispute and who chose the ultimate path of getting justice by writing threatening letters known as pulas on small bamboo nodes. In order to reinforce the threat, little miniature weapons made of bamboo were added such as spears, a knife, a booby trap, and flint and tinder. 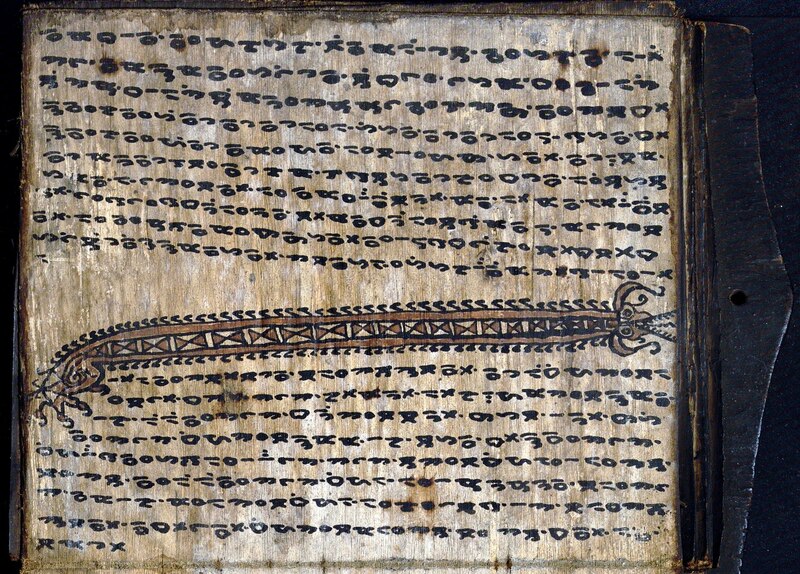 Yet the missionaries supported the script, if not the literature, recognizing the Batak language and its script as vital to the culture. They created typefaces and printed a variety of books in Batak until the end of World War I. 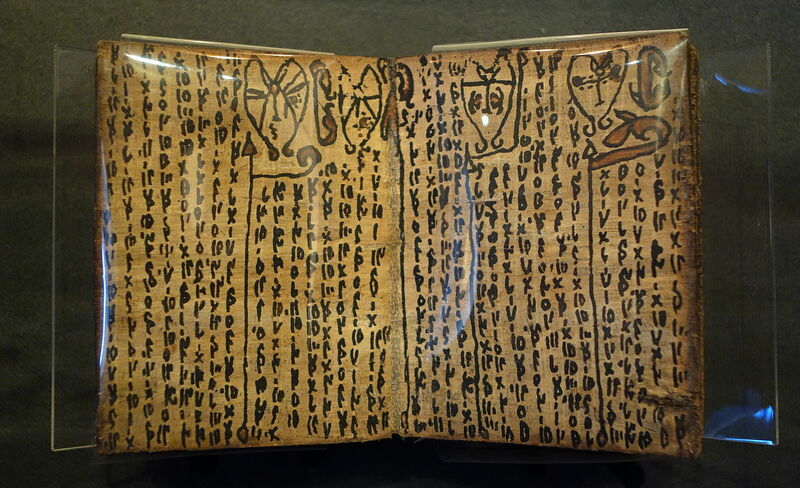 When they stopped, it was for a reason all too common in colonial cultures: the traditional writing system had come to seem insufficiently sophisticated. The Batak script is now in very marginal use. In most Batak communities only the datu are able to read and write the Batak alphabet and they use it mainly for calendars and magical texts. It is taught a little in North Sumatran elementary schools, more for cultural purposes than as a practical writing system for Batak, which, when written, uses the Latin alphabet. 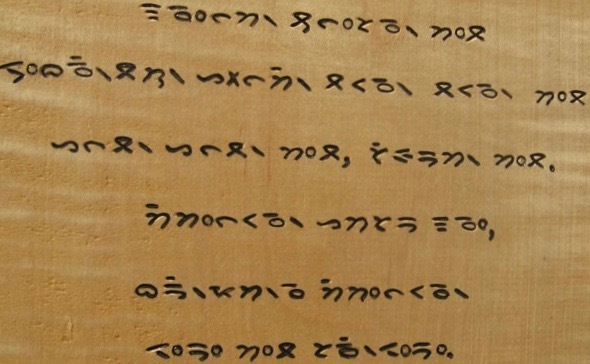 Batak script is still to some extent used for display and decorative purposes, in the signage of shops and governmental institutions, on street signs, and in the universal art of the T-shirt. 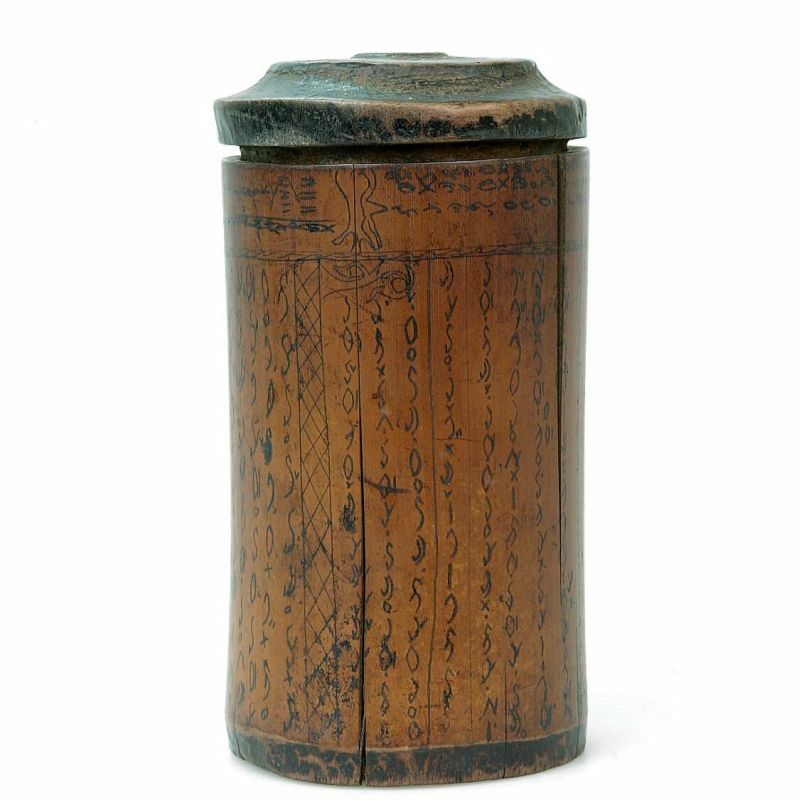 Batak divination text in Karo Batak script, incised on a bamboo container. Photo credit: British Library, Or. 16736.